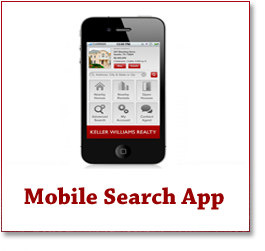 With the weather warming up, you’ll no doubt start spending more time outdoors. 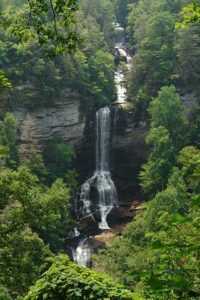 Some of my favorite springtime adventures are hikes to the Upstate’s amazing waterfalls. Find out more in this week’s post. Reedy River Falls is located in Falls Park in the heart of Greenville, SC. The best view of the 28-foot drop is from half way along the pedestrian suspension Liberty Bridge. 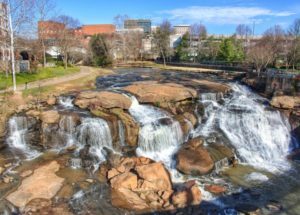 In 1773, Richard Pearis (one of the area’s first white settlers) purchased land along the Reedy River from Cherokee Indian chiefs to operate his grist mill. Located in Jones Gap State Park, Rainbow Falls drops over 100 feet. Seeing the falls requires a strenuous five-mile round-trip hike – but the view at the end is well worth it. The trip is arguable most rewarding in the spring, when azalea, meadow rue, and Solomon’s plume envelope many of the boulders around the falls. The 4-mile round-trip trail to Raven Cliff Falls is one of the most popular at Caesars Head State Park. The waterfall itself is over 400 feet tall and is one of the most photographed waterfalls in the state. It gets its name from the ravens that breed in the high cliffs that form the falls. (Over 150 species of ravens have been identified in this region!) There is also a 6.6-mile round-trip hike to a suspension bridge that crosses the creek above Raven Cliff Falls. 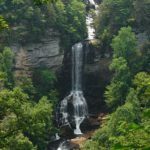 It’s only an easy 10-minute hike to get to the base of this 100-foot waterfall, and the trailhead is only a 10-minute drive northwest of Walhalla, South Carolina. Afterward, have a sandwich in the nearby picnic area or bring a flashlight and check out Stumphouse Tunnel, a partially-completed railroad tunnel that extends 1,617 feet into the mountain. 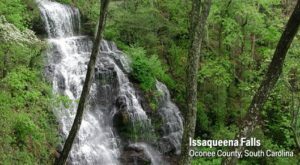 Issaqueena Falls is named for an Indian woman who hid on a ledge of the falls to avoid capture as she fled to warn her English lover of an Indian attack.